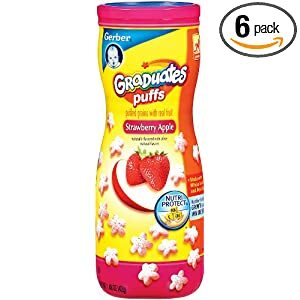 Save 55% on Gerber Graduates Puffs, Free Shipping! Amazon currently has some great Gerber Graduates deals, and there's an excellent one going on today! priced at $11.00 on a one-day sale. You can save an extra 30% when you order with Subscribe & Save and use Amazon coupon code GERBR434 at checkout. After all discounts, you'll get 6 containers of Gerber Puffs for $7.70, which is 55% off the list price of $17.06! That makes each container just $1.28! Want to see the other Gerber products that are eligible for the Amazon coupon code? Here are all the Gerber deals!